For more than thirty-five years, readers have wondered what happens to the mystery armadillo on the last page of Sandra Boynton’s classic board book, But Not the Hippopotamus. Now, at last, comes the long-awaited sequel. Behold the armadillo, a cute and curious creature who follows his nose wherever it goes. Join him as he quietly travels the less-traveled road: he picks cranberries, stops and smells the flowers, takes a nap in the meadow, searches out the source of a beautiful melody, and at day’s end passes an overeager hippo sprinting the other direction. Told with Boynton’s signature charm and unpredictability, But Not the Armadillo is a gentle and worthy companion book to But Not the Hippopotamus—perfect for curious little kids and grown-ups alike. And for everyone who has ever been concerned about the armadillo: Don’t worry. He’s completely fine just the way he is. 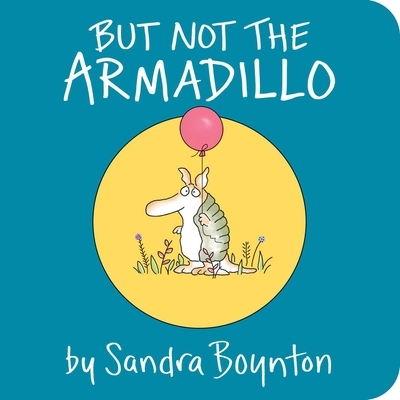 It might sound strange to call a board book “long awaited,” but for those who have puzzled and perhaps even argued over the message of the great Sandra Boynton’s 1982 “But Not the Hippopotamus,” the arrival of a follow-up called BUT NOT THE ARMADILLO (Simon & Schuster, 14 pp., $5.99; ages 0 to 4) is exciting news. In the previous book, a solitary hippo politely refused to join other animals in various activities — dancing, shopping, drinking juice. Was she rejected and isolated, or just, you know, a bit of a loner? And when, on the last page, she finally agreed to hang out with everyone else, what to make of the armadillo who then appeared, with the line “But not the armadillo”? Some found it off-putting — a testament to the persistence of loneliness and alienation, a “Bartleby” for toddlers. Others applauded the self-determination exhibited by both the hippo and the armadillo. I am here to tell you that Boynton has settled the question: The armadillo, “with his armadillo nose,” really likes to wander around by himself, following that sausage-shaped schnoz “where it goes.” He sniffs flowers, picks cranberries, stretches out languidly for a nap. He hears music from far away. A hippo (ahem) rushes busily by — “she wants to run and play.” But, you guessed it, “not the armadillo.” And that’s O.K., we’re helped to see: “He doesn’t like to hurry.” There’s one more beat, a moment of parting grace that shows why Boynton is the absolute master of board books. “Please scratch his armadillo nose and tell him not to worry.” To each creature his or her own.